FG Trading employees are a team of dynamic individuals ranging from sales and administrative personnel to factory managers and technical consultants. 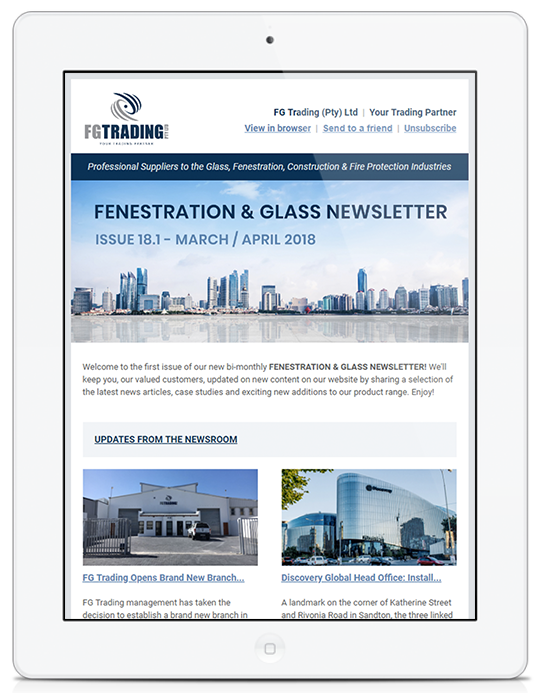 Fraser Global Trading is the leading supplier of products and machinery to the glass, fenestration, construction and fire protection industries across Southern Africa. The company is growing steadily and working at Fraser Global Trading offers plenty of room for personal growth and career advancement as well as the opportunity to work with people from all over Africa and the world. Our local team is a dynamic group of professionals from various backgrounds who work in close collaboration with one another to deliver high-quality solutions and services to our customers. We strive for excellence in all areas of our business and the integrity, loyalty, hard work and dedication of our team does not go unrewarded. As a member of our team you would be expected to have exceptional communication and co-operative skills for working with other people as well as take responsibility for a diverse range of tasks in a personal capacity, taking initiative and working independently when necessary. Naturally a background in glass, glazing, fenestration, construction or a similar field is advantageous but not always required.